Origin Wheat plant is inherent to United States but now cultivated in China, North Africa, Southwest Asia, Turkey, Iran, Arabian Peninsula and South Europe. It is the oil which has been extracted from the germ of wheat kernel. This oil is refined which possess high content of Vitamin E which acts as an antioxidant. It is rich in octacosanol which helps to enhance the physical performance and promotes the muscular energy. It is useful for rejuvenating, moisturizing and protecting mature and drying skin. This cooking oil is easily perishable and expensive. It is loaded with anti-aging and antioxidant properties that helps to prevent the health problems like cardiovascular disease, cancer etc. It also slows down the signs of aging such as wrinkles, fine lines and premature aging signs. 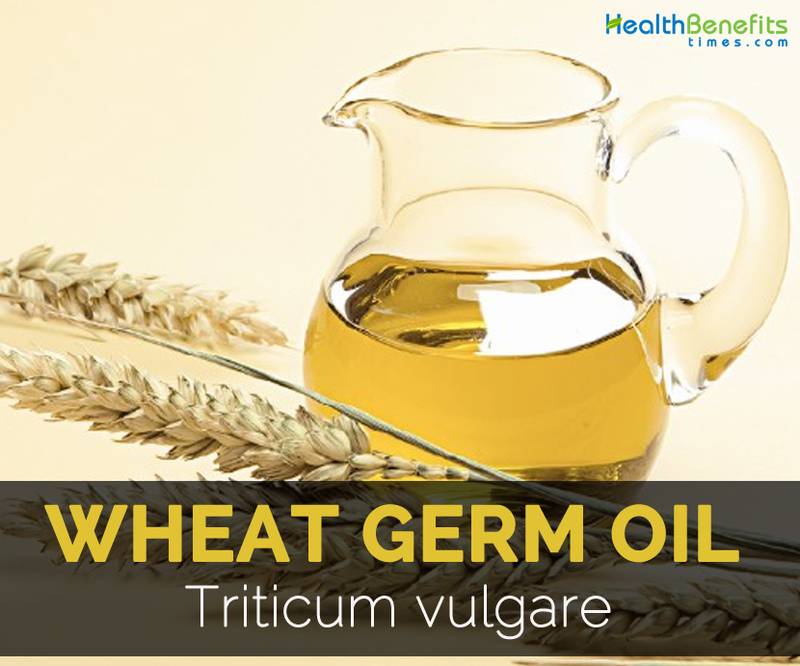 Other common names for Wheat germ oil are Wheat oil, Triticum aestivum and Triticum durum. The color of this oil ranges from dark yellow to brown. It possess a heavy odor with nutty aroma. Wheat plant is inherent to United States but now cultivated in China, North Africa, Southwest Asia, Turkey, Iran, Arabian Peninsula and South Europe. Wheat is one of the ancient grain crops which are known to the human beings. Firstly it was used for making brad since 4000 years ago when the wheat cultivation took place in Nile valley. It was spread across Asia by 4500 and then reached China. In 2000 BC, the wheat cultivation was started by English after it became substantial diet to Chinese and Egyptian civilizations. One cup of 218 grams of Wheat germ oil provides 1927 calories, 325.69 mg of Vitamin E, 218 g of Total lipid fat, 53.8 µg of Vitamin K and 43.6 mg of Choline. The same serving size also provides 40.984 g of total saturated fats, 0.218 g of myristic acid, 36.188 g of palmitic acid, 1.09 g of stearic acid, 32.918 g of total monounsaturated fats, 1.09 g of palmitoleic acid, 31.828 g of oleic acid, 134.506 g of total polyunsaturated fats, 119.464 g of linoleic acid, 15.042 g of linolenic acid and 1206 mg of phytosterols. Wheat germ oil is an excellent source of Vitamin B complex, Vitamin B6, potassium, magnesium, phosphorus and other nutrients. It has high content of nutritional value in comparison to other grains and vegetables. 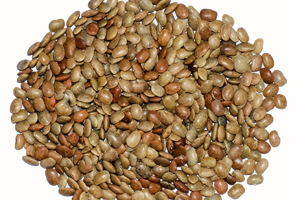 It is composed of about 25% of total nutrients and is loaded with numerous health benefits. This oil has omega-6 acid, palmitic acid, oleic acid, lecithin, squalene and stearic fatty acids. It also possesses lecithin, protein, minerals and essential fatty acids. Due to the richness in minerals and vitamins, it keeps the body healthy from inside. Being a great source of Vitamin E, it helps to prevent hair fall, improper metabolic functions and cancer. The intake of Vitamin E or Wheat germ oil helps to avoid these problems. This oil is very helpful for maintaining heart health. It has good amount of Vitamin B complex that helps to normalize the flow of blood in the body. It has Omega-3 fatty acids that is helpful for maintaining heart health by lowering the cholesterol problems and normalizing the blood pressure. About 28% of protein is available in the wheat germ oil. It provides nutrients to the cells and repairs cell damage. It also assist in transporting vitamins, minerals and nutrients to the cells. It consists of linoleic acid, phospholipids and Vitamin E that helps to maintain skin health. The application of wheat germ oil helps to prevent wrinkles and other signs of aging. It is a great source of antioxidants that prevents the damage caused by free radicals. The addition of Vitamin E to the diet helps to get healthy hair. The deficiency of Vitamin E in the body results in dry, rough and weak heair. Wheat germ oil is an excellent source of Vitamin E that helps to enhance the growth of hair and provides a healthy hair. It could be used in the form of capsules, oil or flakes. Wheat germ oil has octacosanol which is a long chain, saturated and primary alcohol that helps to promote the muscular energy. It provides oxygen as well as energy while performing exercise so it is useful for sportspersons. This oil helps to uplift mood due to the presence of Omega-3 fatty acids by regulating the nervous system. It has Vitamin B complex which helps to lower stress. 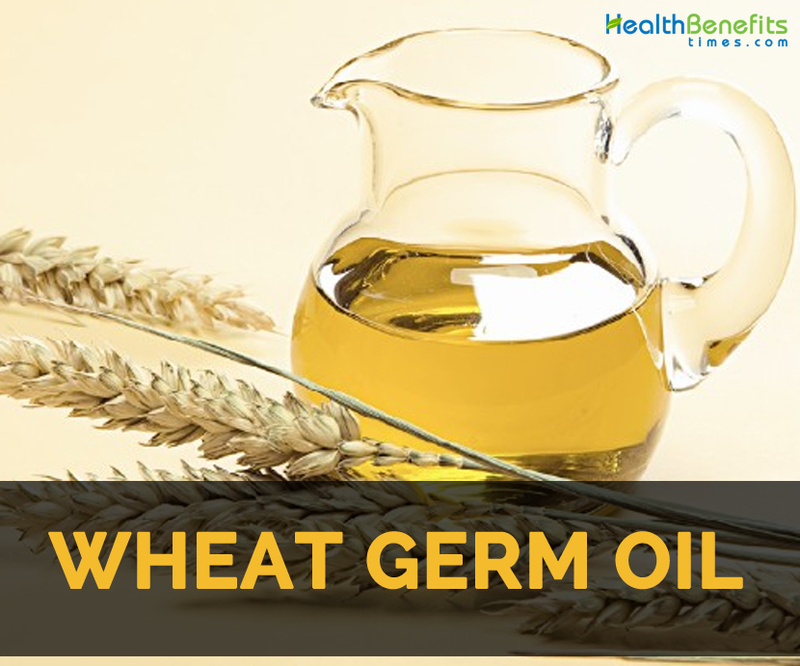 Wheat germ oil helps to prevent the birth defects such as miscarriage and impotence. So it is advised to take wheat germ oil during pregnancy. It also provides healthy red blood cells. Wheat germ oil prevents the skin conditions such as dry skin, eczema and psoriasis. The topical application of this oil helps to repair the skin. It has adequate amount of magnesium that helps to promote the healthy level of blood sugar that is helpful for the diabetic patients. It helps to control the sugar level as well as diabetes. It helps to treat the skin ailments such as inflammation and scarring. It is used to treat vitiligo, psoriasis, wrinkles, dry skin conditions, scars, stretch marks, hair loss and eczema. It also treats malnutrition problems. It cures malignant attacks and cardiovascular ailments. It softens the skin and also prevents the stretch marks in pregnant women. It makes the hair healthy, strong and glossy. It eliminates toxins from the body. It increases the circulation of blood and prevents dizziness and fatigue. It provides relief from muscle fatigue, muscle spasms and muscle aches. It also cures nervous disorders. The gluten or wheat allergic people should avoid using this oil. It might cause allergic reactions in sensitive individuals. The heart patients should monitor their intake while using Wheat germ oil. It may cause the side effects such as diarrhea, gas, flu, nausea, and dizziness. This oil is used in pasta, salads, cereals and oatmeal that helps to add taste. It could be added in smoothies for additional nutrition. It is used in preparing breakfast cereals, baked goods, fish, meat or poultry products, pizza, pasta, tortillas, snack foods, batter coatings and mixes. Wheat germ oil is used in the production of shampoos, soaps, anti-aging products, moisturizing creams, sunscreen lotions, fairness creams, foot creams and scar treatment products. Due to its moisturizing property, it is used in skin care products. It is combined with other carrier oils in aromatherapy to massage the skin. Wheat germ oil has been extracted from the germ of wheat kernel. The unrefined oil has high content of essential fatty acids, Vitamin E, regenerative and antioxidant properties. It is sticky, viscous oil having a rich and wheaty odor. Richness in Vitamin E, it possesses regenerative and an antioxidant property that benefits ageing skin and also counteracts free radicals. It has nourishing properties that treats dry skin and assist in forming new skin cells, heals scars and improves circulation. It is highly used as cooking oil which is easily perishable as well as expensive. Unrefined oil has strong aroma and thick consistency. Native Wheat plant is inherent to United States but now cultivated in China, North Africa, Southwest Asia, Turkey, Iran, Arabian Peninsula and South Europe. Calories in 1cup (218 gm) 1927 Kcal. It is used as a treatment for inflammation and scarring. It lowers the appearance of wrinkles. It cures vitiligo, psoriasis, wrinkles, dry skin conditions, scars, stretch marks, hair loss and eczema. It is a cure for malnutrition problems. It is used to eliminate stretch marks in pregnant women. It prevents dizziness and fatigue. People allergic to gluten or wheat should avoid it. Allergic reactions might be experienced in sensitive individuals. The heart patients should monitor the intake of oil. Side effects such as diarrhea, gas, flu, nausea, and dizziness might be experienced. It is used in pasta, salads, cereals and oatmeal. It could be added in smoothies. It is used in breakfast cereals, baked goods, fish, pizza, pasta, tortillas, snack foods and others. Wheat germ oil is added in shampoos, soaps, anti-aging products, moisturizing creams, sunscreen lotions, fairness creams etc. It is combined with other carrier oils in aromatherapy.